A funny, real-life guide to bore-proofing marriage, Fun Loving You is a refreshing look at how marriage can be the source of joy God always meant it to be. What is the true secret to spiritual growth for couples? The answer, of course, is more moments together with the one you love. When you are lifting up your relationship and the rest of your life to God, you won't be able to keep spiritual growth from happening. In the midst of hectic schedules and commitments, it can be difficult to experience deep spiritual connection. And yet, it is refreshment from the Lord that we all desperately need. 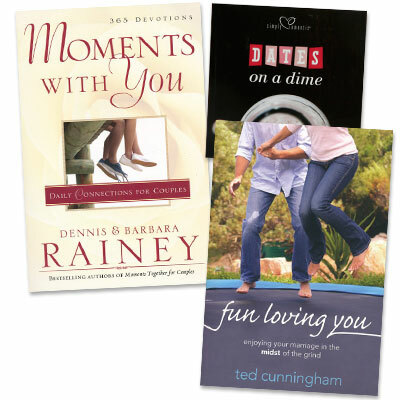 In the pages of Moments with You, best-selling authors Dennis and Barbara Rainey offer inspiring Scriptures and insights to get you started or to continue growing in your quiet times together. Enjoyable, interactive, and easy to use, these 365 all-new biblical devotions provide a daily discussion point, a prayer, and a Scripture reference. If you desire a deeper spiritual connection with God and with your spouse, you will come to treasure this book.